These people just never, ever learn. Seattle and San Francisco both now have company… New York restaurants are now going out of business because of mandated minimum wage hikes. Way to go progressives. Smart. Last year alone, over 1,000 restaurants closed their doors over this insanity in America’s largest city. Adding insult to injury, McDonald’s is going to automate kiosks in many of their restaurants there, putting even more workers out of a job. That means cooks, servers, counter people, order takers… all in the unemployment line. And they begged for this when they demanded $15 an hour as the minimum wage. In 2012, hundreds of minimum-wage workers in New York launched the movement by walking off their jobs to protest and demand a higher minimum wage. Now they are getting exactly what they demanded, but they should take a long hard look at Seattle over this. A new study published by University of Washington economists found that, as conservatives have long argued and as basic economics would seem to have predetermined, Seattle’s unprecedented minimum-wage hike actually hurt the very workers it sought to help. And it is doing the same thing in San Francisco and New York. Duh. San Francisco is not the only place where restaurants are closing because of the hike in the minimum wage; now it’s hitting New York with a vengeance, too. According to The New York Post, the state of New York lost 1,000 restaurants last year; jobs as cooks, servers and dishwashers only increased by 1.4%, far less than the 4.4% rate of growth exhibited between 2010 to 2015, according to the Employment Policies Institute. In New York City, where restaurants are forced to pay their employees $12 an hour, $1 more than other employers, job growth was 3.4% in 2016 as opposed to 7% from 2010 to 2015. It’s even worse in 2017; the growth has only been 2%. Among full-service restaurants, growth has only risen 1.3%; the last five years it was 6.5%. I don’t know where these people think the money comes from for higher wages. Restaurants have to charge their customers more because of this. Which means people will stop going to these restaurants and it will drive them out of business. It’s simple supply and demand economics which is beyond the mental grasp of these morons. This also means that restaurants will hire fewer workers, which means ever fewer jobs. Last year, New York passed legislation that will raise the minimum wage to $15 by 2018 for almost all businesses in the Big Apple. Schnipper’s Quality Kitchen, a New York burger chain, is already making tough cuts to compensate for this added expense. And everyone else will follow. They’ve had to reduce their workforce by ten percent and this is only the beginning. 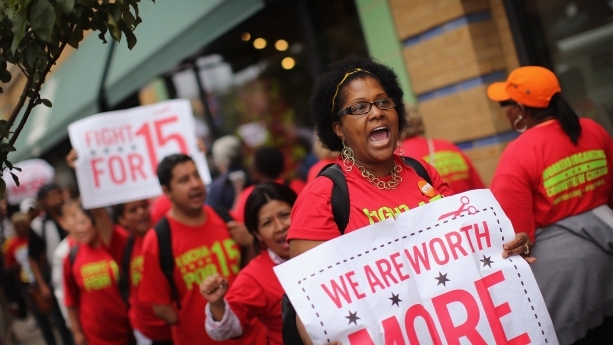 Fight for $15 is resulting in lower wages and less opportunity everywhere they succeed.